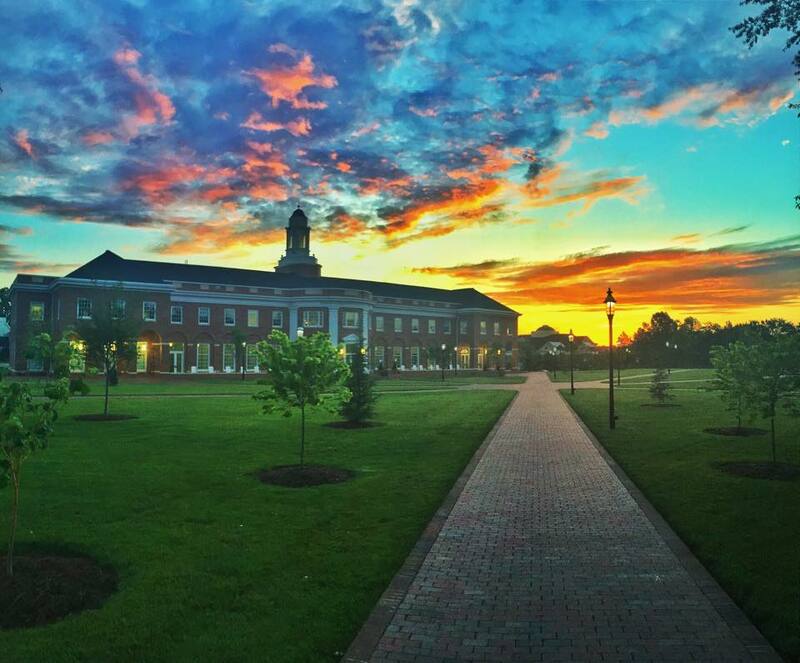 Elon University is a private mid-sized university with just under 6,000 undergraduates located in downtown Elon in the beautiful Piedmont region of North Carolina. Elon is between Greensboro and the Raleigh-Durham-Chapel Hill triangle. The curriculum is grounded in the traditional liberal arts and sciences and the university is renowned as a national model for engaged and experiential learning. Transportation: The nearest major airport to Elon is Piedmont Triad International, located in Greensboro, just 30 minutes from campus. Many people also fly in and out of Raleigh/Durham International Airport,approximately a 50-minute drive. Taking Amtrak is another option; the station in Burlington is just a 7 minute quick Uber or taxi to campus. Stay: In Elon, there is only one option, the 12-room Acorn Inn, just one block from campus. Most families stay in nearby Burlington, (approximately a 10-minute drive) at the Courtyard Marriott , Holiday Inn Express, Hampton Inn and Suites or the Best Western Plus Burlington. In Greensboro, 20 minutes west, check into the more luxurious Proximity Hotel garnering high praise as a climate-conscious property that doesn’t sacrifice style or quality. Parents are raving about The Drury Inn - definitely worth a try! Coffee: Right on campus, join the students at Irazu in the Mosley Student Center or Acorn Coffee Shop serving Starbucks coffee and pastries in a cozy atmosphere. The Oak House is another popular local coffee spot where later in the day you can also enjoy artisan wine and beer. In historical Burlington start your day at The Blend and Co.
Breakfast: In the Daniel Commons on campus, grab a quick bagel before your tour at Einstein Bros, with an early opening of 7 am. Skid’s is many teachers and students go-to spot, known for the best breakfast around Elon. Staying in Greensboro, head to Scrambled Southern Diner, where the chicken and waffles and shrimp and grits are the stars. West End Terrace is very popular for brunch and known for their excellent breakfast cocktails. Lunch: Follow the students to Pandora’s Pies and Chick-Fil-A. If you’re in the mood for something spicy, try Simply Thai, also serving sushi in addition to their Thai specialties. Another option for a quick, healthy meal is the cafe at Company Shops Market, a gourmet grocery store stocked with local produce. Make a plate from their hot or cold salad bar or choose from the selection of made to order sandwiches. Casual: The Root Trackside is one of the more popular dinner spots in Elon. Students rave that everything on the menu is worth trying. Have you ever had a fried green tomato, roasted cauliflower or chicken and waffle taco? Well at Tangent Eat Bar eclectic tacos are the name of the game, washed down with mixed drinks or some southern Cheerwine soda. (The Root and Tangent are also good choices for lunch.) Head to West End Terrace for a fun gastropub experience, highlights of the menu include tacos and craft beers. BBQ lovers don't mind the drive to Greensboro for a chance to eat at legendary Stamey’s BBQ. A Step Up: Many families like to stay in Greensboro to enjoy the many excellent restaurants in town. Right in the Proximity Hotel, Print Works Bistro is considered one of Greensboro’s best, open for breakfast, lunch, and dinner with an emphasis on creative comfort food. Award winning 1618 Concepts is well regarded for its creative seafood menu, attracting diners from all across the state. Two other hot spots include Four Flocks and Larder and Lucky 32. Staying in Burlington, students love to book a table at Prego’s Trattoria when their parents come for a visit. Late Night Snack: At one time during your visit a homemade ice cream at Smitty’s is a must. They have many flavors to choose from as well as milkshakes, sundaes and yogurt smoothies. Local Attractions: In Greensboro, visit the International Civil Rights Center and Museum to learn about the history of the Civil Rights movement. A favorite hiking trail of students is The Hanging Rock Trail in Hanging Rock State Park in nearby Danbury. Explore the quaint little town of Gibsonville, just 10 minutes from Elon; featuring a model train in the town center, a popular chocolate shop, ice cream parlor, in addition to other restaurants and shops. Elon is a close-knit university community in a rural area with access to bigger towns and cities if you want to explore. It allows me to pursue both academic and personal interests within the university and the surrounding communities. Elon is moving towards having a larger student body in the next five years! (From the current 6,600 students to around 8,000.) This is exciting for university growth while still keeping an intimate school feel and maintaining the faculty to student ratio. Most students make the 10-15 minute drive to Burlington (skipping downtown Elon) for their shopping, grocery and pharmacy runs, and to go to the movies. The hub of Burlington is Alamance Crossing with an array of shops, restaurants, and a theater. The downtown area is cool but very small. You have to drive 20 minutes to Greensboro for anything more exciting. That doesn’t bother me at all, but if you need more of an urban setting, this is not the place for you. Just toured the Elon University Campus? Are you a Elon University student, parent or Alumni? Fill out this 2 minute survey to supplement our Daytripper University Guide for Elon University!